Botox® and dermal fillers are some of our most popular skin enhancement services, for men and women of all ages. In fact, Botox is the world’s single-most popular skin treatment. These treatments work and they are super-convenient, with appointments that take just a few minutes, right in our Cherry Creek office. Botox, dermal fillers, Kybella, and PRFM are all absorbed by the body over time, so we recommend periodic appointments to renew your injections and maintain the look you want. 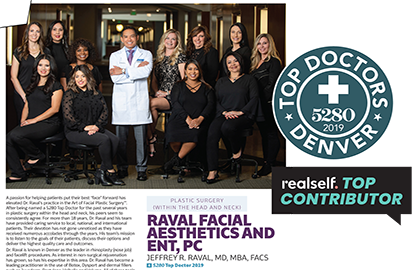 Jeffrey R. Raval, MD, MBA, FACS and our team of highly-trained Paramedical Aestheticians are friendly as well as skilled, and the atmosphere here in our office is comfortable and supportive. Botox has become a go-to treatment over the last two decades. Injections are used to improve or prevent facial signs of aging by reducing visible wrinkles. Botox doesn’t directly affect the skin but works to ease muscle contractions that cause wrinkling over time. Botox is also an effective solution for treating hyperhidrosis, or excessive underarm perspiration. Also based on botulinum toxin, Dysport is a purified neurotoxin that is injected to relax muscles that cause wrinkles and brow contractions. For some patients, Dr. Raval says Dysport can work faster and last longer than Botox. Dermal fillers are also delivered via injection. They are used to restore youthful fullness to the lips, eye, and nose areas. The result is smoother features without unwanted wrinkles and folds. Dermal fillers can reduce and, in some cases, erase visible signs of aging. As with Botox and Dysport injections, the amount of filler can be varied to provide just the amount of change you want to see. RESTYLANE® is a family of injectables made from a non-allergenic biodegradable gel. Restylane is used to restore facial volume, especially in the lips and to the nasolabial folds between your nose and mouth. 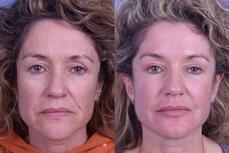 The result is fuller and more youthful features. Restylane Lyft® is part of the Restylane product family and is the only FDA-approved injection specifically formulated to add volume to the mid-face area, particularly the cheeks and smile lines. Injections can last up to 12 months. JUVÉDERM® is a well-known name in dermal fillers. It is based on hyaluronic acid, a substance produced naturally by your skin. Juvederm was the first injectable to be FDA-approved for individuals with darker skin tones. It helps restore smoothness and volume to the face by removing wrinkles, deeper folds, and smile lines. Voluma, another product in the Juvederm family, is specifically used to rejuvenate the cheek and mouth areas. It can improve even moderate to severe wrinkles and folds, and the injections can last up to 2 years in some cases. Included in the Juvéderm family are also VOLBELLA® XC, VOLUMA® XC, and VOLLURE® XC. Want to get rid of your double chin to restore a more youthful jawline? Kybella is the only non-surgical, FDA-approved treatment for that. It is an injectable that uses a naturally-occurring organic acid to dissolve fat deposits, which are then absorbed by the body. PRFM is a healing catalyst made from a small sample of each patient’s blood. It continues to work for up to a week. At Raval Facial Aesthetics, we use PRFM as a stand-alone treatment or in conjunction with other procedures to speed and enhance results. It is especially effective for stimulating hair regrowth, reducing acne scars, and reducing under-eye discoloration. Let’s find out. It’s easy to schedule a personal consultation. We’ll answer all your questions and help you choose the option(s) that will be most effective to achieve your aesthetic goals.